OhNoo Studio today released a new trailer for Tsioque, an old-timey point-and-click adventure about a young girl imprisoned in her former home, a castle that's been taken over by an evil wizard. The girl, a "little warrior princess" named Tsioque, must escape and thwart the wizard's plans before he can take over all the land. It sounds dire, but as the video makes clear, the game isn't quite as heavy-handed as it may seem. Tsioque is coming up on the midway point of a Kickstarter campaign that's so far raised a little more than $20,000 of a $35,000 goal. One of the reasons it's noteworthy is the presence of a free, downloadable demo. It's short and, as usual, may not represent the quality of the final product, but it provides a good look at both the art and the style of play. In fact, much of the gameplay in the trailer is taken from the demo. The developers say in the Kickstarter pitch that Tsioque is inspired by games like Day of the Tentacle, Pajama Sam, Heart of Darkness, Dragon's Lair, and Indiana Jones and the Fate of Atlantis. 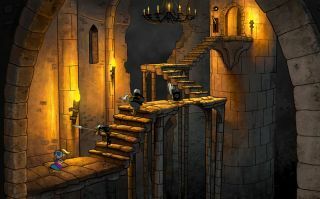 "[Tsioque is] made in the spirit of the classics I grew up with, but, at the same time, telling an original, personal story," co-creator Alek Wasilewski wrote. "It's both the game I had always wanted to play as a kid and a present for my daughter to enjoy today—for her to have fun, and perhaps even learn something in the process." The game will be completed and released with or without a successful Kickstarter, OhNoo said. "However, with your support, we can invite more artists to the project and truly let it spread its wings. Everything would get done quicker, be prettier, more detailed—and, eventually, we could simply put everything we intended there, after achieving a certain stretch goal."